Projects that improve your quality of life – and set you up for a great Return on Investment – are important components of many financial decisions. Here are some guidelines on what projects make good home improvement options. Replacing carpet or choosing to go with a laminate are both great choices and can fit many budgets. If you are considering selling though, hardwood floors are what buyers look for. They are easier to sell and sell for more money. And not all hardwood floors are equal – they need to be consistent and match your home. Another premiere quality found desirable by buyers is if they have a specific look. Hand-scraped finishes, old or engineered looks are the most desirable. 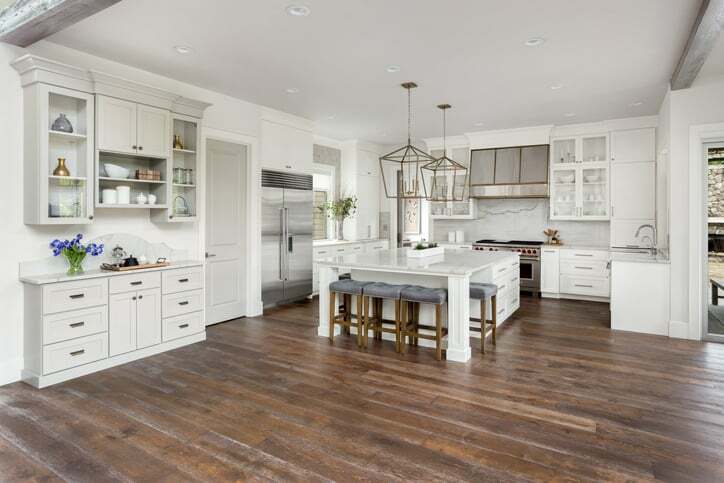 One thing that will absolutely turn off a buyer is to have a variety of flooring styles, or having two different types meet in a highly visible heavy traffic area. Mix and match hardwood flooring? Realtors say this is a cardinal sin. More important than hardwood or carpet is consistency. In general hard surfaces are better than carpeting but fresh carpet in current styles can still be a huge improvement. Bedrooms are the prime places for carpet. Kitchen remodels can add anywhere from 70-80% return on investment. Costs can range anywhere from $20,000 for a minor kitchen remodel to over $56,000 for a midrange remodel. Minor details like fresh paint or a faux-wood finish can enhance your cabinets. New backsplashes and tile are attractive and popular as well. Local home improvement stores have classes to teach you the skills if you want to try it yourself. Stainless steel appliances are very popular on the market now. Consider any remodel efforts in line with what is in your kitchen. Matching colors and consistency make a big difference. Rolling islands are great additions, and relatively inexpensive for the convenience they bring. Pot racks and hanging wine bottle holders can free up cabinet space and are easy additions that draw the eye. Custom cabinets, hardwood floors, granite counters, and high-end appliances are all on the more expensive side of common remodeling projects. Remodel project budgets should stay around 5 to 15 percent of the value of the home. If you are planning to sell soon, keep toward the lower end. If you are going to be living for many years to come, consider spending toward the upper part of that limit to really enjoy the improvements. Both kitchen and bathroom remodels drive up the project costs if you need to change structure and plumbing. If you can plan around your existing floor plan without making excessive structural or plumbing changes, you will be able to keep costs down. An average bathroom remodel can run upwards of $10,000 but you could spend half that to fix up essentials. These projects are in the top range of getting the most value for your money invested and are highly popular. Focus on your faucets. Buyers are looking for under-mount sinks most often. As for countertops, granite or marble are the most popular upgrades. Overhead lighting is losing appeal and being replaced by wall mounts, but be sure that the mirrors have even lighting with no shadows. Heated flooring is another improvement that is drawing in buyers and lend a luxurious start to any morning. Showers with body sprays and stone surround tile and natural rain shower heads are also extremely popular. Even if you are staying in your home, consider this kind of remodel project to really improve your quality of life. We spend a lot of time in your bathrooms and really enjoying your personal time can do wonders to improve your quality of life. On the low end of cost for projects, painting can be the quickest way to transform a room. If you can clean up your walls with just basic cleaning, then do that. If your color scheme you picked when you first moved in screams you, but would just scream to the majority of buyers, consider doing neutral tones. Brightly colored rooms can rub buyers the wrong way and really leave an impression on potential buyers. Whites, off-whites, grays, and beiges are reliable. Neutral palettes let potential buyers use their mind as a canvas – which directly helps make the sale. If repainting, choose paint that does a good job of hiding the old paint and leaves a smooth surface. On the outside, exterior paint and siding are big points to add curb appeal. Repainting the entry door is not a bad idea unless it serves as a focus on how outdated and tired the rest of the exterior looks. Mow the lawn, trim overgrown shrubs and put a fresh layer of mulch on flower beds – give your home a basic makeover. Attractive lawns and landscape can boost the value of your home by 5-11%. Landscaping should be done with an understanding of what plants fit the climate. Some plants need more shade, some less, and picking where to place the right plants is all part of successful landscaping. Plan out the landscape project prior to digging anything up. You may want to consult with or directly hire a professional landscaper. Their experience and knowledge of the local plants can mean the difference between a beautiful yard and a lot of dead plants a few months after everything has been planted. We are an in-home showroom! We will come to your place to show you samples and discuss your flooring needs. Mansfield Flooring is an In-Home showroom. We will bring our samples to your home or business to show its appearance in the room. Mansfield Flooring is a fully licensed, bonded, and insured flooring company serving Mansfield, South Arlington, South Grand Prairie, Midlothian, Alvarado, Venus, and Burleson for more than 25 years. We were really impressed by their professionalism and competitive pricing. We looked at many companies and Mansfield Flooring was one of the best overall. Would definitely recommend speaking with them. I recently replaced the flooring in my living room and kitchen. I had several estimates done and Mansfield Flooring was extremely reasonable and had the largest selection of flooring of all the flooring companies I looked at. I found beautiful tile for both areas (I chose a wood looking tile and am soooo happy with it!) They came out and gave me an estimate and began work very quickly. The guys that came out to install were on time and professional and I could not be happier with how beautifully it turned out!!! I highly recommend Mansfield Flooring! The installers arrived late, but called ahead to say they were stuck in traffic. It was annoying, but understandable. They were installing tile in the kitchen and dining room and I was there to supervise. When they finished, one of the installers did a "walk-through" with me to make sure everything was okay. My only complaint had to do with one of the transition pieces. They insisted on replacing the existing one with one that didn't quite fit. Other than that, they did a good job and cleaned up before they left. Overall, I was pleased with the work. Let me start by saying that the customer service I received through this company was phenomenal! Any questions or concerns I had that were answered right away. I wanted to put granite countertops and backsplash and tile in my kitchen, as well as replacing the flooring in my bathroom. They helped me choose the perfect material for my home as well as my budget. The pricing was by far the most reasonable out of four different companies I looked into. I am absolutely amazed with the outcome of my kitchen and bathroom. It was done in a time and professional manner. I would definitely recommend this company to all of my family and friends. We will be doing all of our future business with Mansfield Flooring. We had our floors installed earlier this year and were very pleased with the finished product. The workmen were on time and very professional. The job was done in a timely manner and the pricing was fair. The manager was helpful in giving us all the flooring options for our home. JOB WELL DONE!